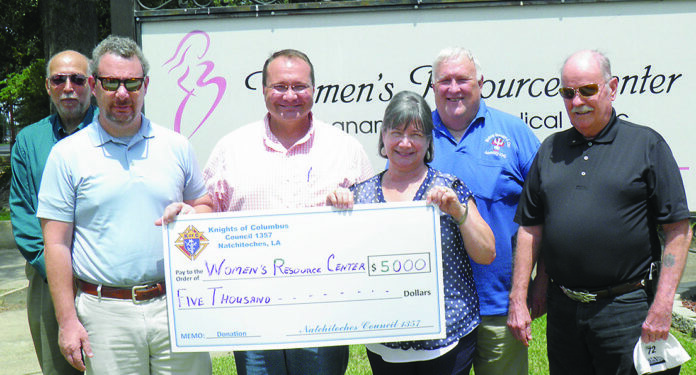 The Natchitoches Knights of Columbus Council 1357 is a Diamond Sponsor of the Women’s Resource Center and their Annual Gala Fundraiser. Serving women in this area since 1989, the Knights support their pro-life efforts and pregnancy medical help. These and other civic donations are made possible thanks to Knights of Columbus Bingo supporters. Pictured are Joe Roque, KC Trustee and WRC Board Member, Jason Methvin, KC Advocate, Dr. David Thibodaux, KC member, Sheryl Hatcher, WRC Executive Director, John Scott, KC member, and Mike Menou, Navigator of the KC Fourth Degree.